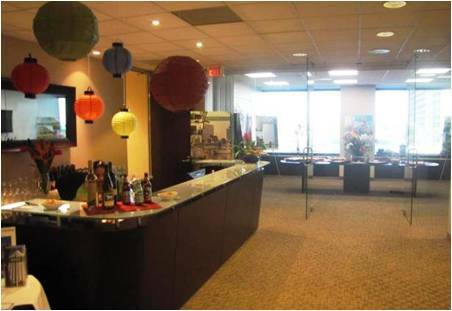 Torrance Executive Suite Celebrates Lease Renewal and Gets A Brand New Look. Barrister Executive Suites, Inc. showcased its newly renovated Torrance location with an Open House business mixer last week on October 15, 2009. The firm recently renewed its office lease for the Executive Suites at 21250 Hawthorne Blvd, Suite 500 & 700, Torrance, California. The event was attended by a variety of business executives and commercial real estate brokers. Dorthy Bright, President of Barrister Executive Suites, Inc. predicts the increased demand for executive suites will continue regardless of the economy. “Our business model allows companies more access to cash flow. In lieu of investing in administrative staff, a phone system and photocopiers, they will see that Barrister provides all of the above. This allows companies to focus on their growth strategy and capital investment. Regardless of the economic environment, Barrister should always be the first alternative in leasing office space. It’s just good business practice.” The Open House event provided an excellent opportunity to preview the location and enjoy some business networking. To find out more about Barrister Executive Suites, Inc. location in Torrance, Click Here.